« Vince Gill Shares His Thoughts on Today’s Country Music..and He’s Right On! There isn’t any way I could be looked to to provide an unbiased review of an Elvis Costello album, that’s impossible for me to do. A fellow who can have a career such as his for so long, reinventing (or rather exploring) his genres and styles, combining those with phenomenal lyricism and musicianship, and topping it all off with a charming personality like Elvis has….well, there just isn’t much not for me to like. But thankfully this isn’t technically a “review” site, rather a place to get to know an album and hear one person’s opinion of it so my “he can do no wrong, or maybe very little wrong” is appropriate here if it is anywhere. Elvis caused a bit of a kerfluffle in 2011 when he issued a statement regarding this album in its deluxe box set format which was selling for $200-plus (although it included a lot of extras like a book, vinyl EP, etc). He essentially was advising his fans to not buy it because “the price appears to be either a misprint or a satire” and instead suggested buying a Louis Armstrong box set would be a more appropriate choice. This album was then released as a CD or DVD (or together) at a much more user-friendly (meaning economical) price. 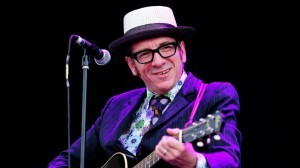 Costello initially did a Spinning Wheel tour in 1986, and it was a fun affair. He had a big roulette-type wheel with as many songs from his catalog on it that could fit, and concertgoers were asked to come up to the stage to try their hand. In 2011 he gave it another whirl (sorry) and recorded some shows in L.A. at The Wiltern for the album/DVD. The song list is a veritable primer on every phase of his musical career, it’s as if it were made for someone who knew nothing of the man. Furthermore, it’s a fantastic demonstration of just how good his live shows are, and that’s coming from someone who’s not always enamored with live recordings. In essence, it makes one want to see him if one hasn’t had the opportunity. The album opens with the full-of-piss -and-vinegar “I Hope You’re Happy Now,” which is Elvis at his spiteful best from Blood & Chocolate, released in 1986. It is followed by a cover of “Heart of the City,” a Nick Lowe tune. 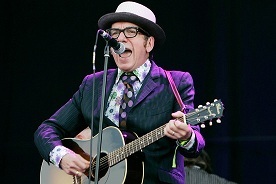 Lowe is a long-time collaborator with Costello, and for that I’m grateful. They work together to do some fine things. 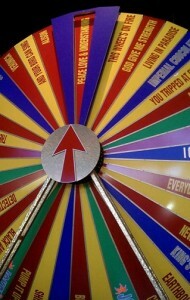 Then the album goes into a grab-bag of selections, which is exactly what the tour and concept are all about. You get something from his debut, something from his 2010 studio release (yes, he did! ), and a lot of variety between. Several worth noting are “I Want You,” part of the push-pull emotional tides of Blood & Chocolate which counters the opening track of this album, and the ever-amazing “Man Out of Time” from my (and many many other’s) personal favorite release, Imperial Bedroom. Last cut in justifying the “Spectacular” in the album title is “(What’s So Funny ‘Bout) Peace Love and Understanding,” originally recorded by Lowe’s first band but given huge popularity on Armed Forces. 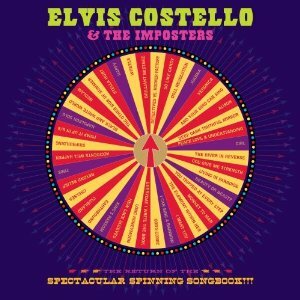 The Return of the Spectacular Spinning Songbook is a look at Costello’s library that seems random, and is to a degree, but besides the songs themselves, it offers a look into just how diverse and multi-layered his catalog is. And it does so in a fine live format that should give a little incentive to someone who wonders just how well an artist can perform and inject an energy into a song that one perhaps has heard many times over, but now with a new and different life in it. A little kerfluffle going a long way! Nice! nice write up KM> lovely man that Elvis.